This is supposed to be one of those "you can make it all in the microwave!" types of recipes, but I actually think that idea with this dish is kinda pointless. It's a spinach salad: it should be completely raw and eaten cold. Sure, I know there are some spinach salad recipes that call for "warm dressing," which in turn will wilt the spinach when drizzled over the leaves...but that's something entirely different. This recipe calls for the spinach to be microwaved. Um, okay. I first started making the very Greek-like dressing. Olive oil, lemon juice, and a bit of sugar is whisked together. Next, add feta cheese (I used a soy version), golden raisins (I used dried cranberries), and minced red onion. 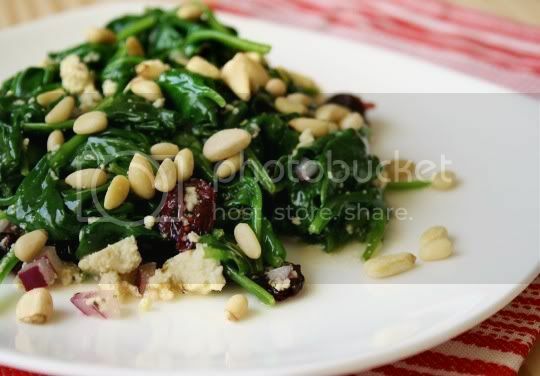 Then you microwave the spinach (gah, I can't believe I'm saying that for a salad recipe) and--get this--the pine nuts! Microwaved pine nuts...yummy (in my sarcasm font). 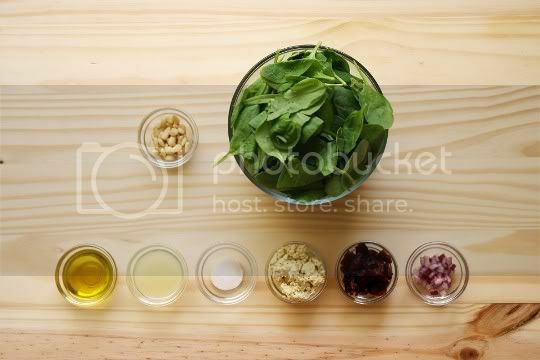 Toss the dressing with the now-wilted spinach, sprinkle with pine nuts, and eat. Quick and simple, but totally unnecessary. Now don't get me wrong, the salad was decent. The flavors work well together: the tanginess of the lemon juice, the sweetness of the cranberries, the saltiness of the feta, the pungent crispness of the red onion. But sheesh, this salad would have been SOOO much better if it had just been prepared raw (with oven- or stovetop-toasted pine nuts, of course). 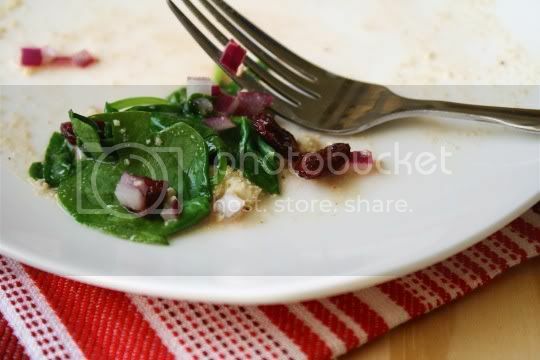 The spinach tasted and felt like it was damn near steamed, which was wayyyy past the wilted stage; cooked spinach tends to get very watery as well, not a good combo with an added dressing. In fact, I'd almost say made as-is, this is more of a spinach side dish. Trust me, go the raw route. Make again? Only if I go the raw way. Microwaved spinach and nuts? No thanks. Vegan variation: Use a soy feta (or other vegan cheese) substitute.